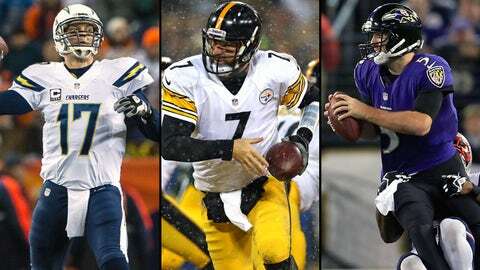 From left, quarterbacks Philip Rivers, Ben Roethlisberger and Joe Flacco will all need wins and help to make the playoffs. On the Friday night before the Patriots played the Ravens in Week 16, coach Bill Belichick took his team to see the new Mark Wahlberg movie "Lone Survivor." The detailed account of a 2006 NAVY SEALS mission in Afghanistan, directed by Peter Berg, was the Friday night activity for a team that went on to rout the defending champion Baltimore Ravens, 41-7, in their building last Sunday. Belichick discussed the movie night after the game. "We do different things from time to time," he said. "Mark Wahlberg, obviously, is a huge Patriots fan and a huge supporter, and I really appreciate everything that Mark did to make it possible to watch the show." "I think the movie certainly had the messages of leadership, perseverance, preparation, and then execution. It’s one thing to prepare, it’s another to actually go out there and play the game and go through the battle the way they do. So, that was a great message, no question, and a great movie." But "Lone Survivor" has had an impact on more than just the Patriots this season. Berg held a screening for the Cowboys in training camp and it led to a string of great practices. Word got out, and according to the Wall Street Journal, other teams requested "Lone Survivor" screenings of their own. One by one, squads clamored for a viewing. The Cowboys, the Panthers, the Browns, the Broncos and the University of Alabama all have seen the movie. Florida State saw the movie the day before the Seminoles blew out Clemson in their biggest game of the season. The movie comes out nationwide on Jan. 10, but if I’m an NFL team fighting for the playoffs this week, I’m getting my hands on "Lone Survivor" and I’m screening it once, twice, maybe three times before Sunday. An evening at the movies could be the difference. Now, on to the picks. Carolina (11-4) at Atlanta (4-11): Carolina can clinch the NFC South and a first-round bye with a win in Atlanta on Sunday. What a difference a year makes. Last year at this time, the Falcons were sitting pretty and looking ahead to home-field throughout the NFC. This year, they’re in the running for a top-three draft pick. This will be Tony Gonzalez’s last game as a pro and there’s certainly something there, but I just can’t see the Panthers dropping this one. Baltimore (8-7) at Cincinnati (10-5): The Bengals haven’t lost a game at home this season and they’re not resting their starters on Sunday. "We want to defend home and make sure we win," Bengals cornerback Adam Jones told the team’s official website this week. "If it was my choice, I don’t want Baltimore to make it." I can’t give up on the defending champs in Week 17. I don’t know how, but I don’t see Joe Flacco and Haloti Ngata and the rest of the Ravens veterans leaving Cincinnati with a loss on Sunday. Houston (2-13) at Tennessee (6-9): After the 49ers embarrassed the Texans earlier this season for their third straight loss, I asked Andre Johnson at his locker if this was as bad as it gets. "I was here for 2-14, so no, this isn’t as bad as it gets." Who knew they’d lose 10 consecutive games since then. Crazy. The upside? They’re looking at the No. 1 pick in the draft in May. Jacksonville (4-11) at Indianapolis (10-5): After winning four of five and three straight, the Jaguars have dropped their past two. The Colts still can claim the No. 2 seed and a bye if they win Sunday and both Cincinnati and New England lose. If only one of those teams loses, the Colts move up to the AFC’s third seed. Jacksonville’s been a nice enough story, but the Colts won’t lose at home. New York Jets (7-8) at Miami (8-7): I watched the Bills-Dolphins game again and it’s scary how badly the Dolphins offensive line played. Buffalo’s defense absolutely dominated. Miami struggles with big, forceful defensive lines. What do the Jets have? Just that. The Jets also are playing for their head coach here. Miami holds the keys to the playoffs, but I see them dropping them on the way to the car. Detroit (7-8) at Minnesota (4-10): This is the last Vikings game ever played in the Metrodome. The Lions are a disaster. Matt Cassel didn’t play well last week in Cincinnati, but he’s been the best starter in Minnesota this season. For those interested, Josh Freeman will not be active in this one. His final stat line with the Vikings? One game, a loss, and $2 million. Good work if you can get it. Washington (3-12) at New York Giants (6-9): The Giants finished the season strong last year with a blowout win over the Eagles in Andy Reid’s last game. The writing was on the wall for Reid before that one. Is this Mike Shanahan’s last stand? We’ll probably know by Monday. Cleveland (4-11) at Pittsburgh (7-8): The Steelers are going to need a lot of help, but it’s amazing they’re alive in Week 17. Remember, they started 0-4. Of the 185 teams in league history to lose their first four games, only the 1992 San Diego Chargers turned it around to qualify for the postseason. Playoffs or not, finishing 8-8 says a lot about this team, this organization and this coaching staff. Todd Haley, included. I’ve watched every one of their games, and Haley deserves plenty of kudos. Incredible job, regardless of what you’re reading and hearing elsewhere. Green Bay (7-7) at Chicago (8-7): The NFL is amazing. The Bears gave up 54 points on Sunday and the big question Monday was "Cutler or McCown?" It doesn’t matter who is playing quarterback if the defense is going to give up 50! But that’s the world we live in. Oh well. This one should be a classic NFC North matchup with no defense and a lot of missed tackles. Denver (12-3) at Oakland (4-11): Peyton Manning needs 266 yards to break the NFL single-season passing yardage record. The Raiders have given up a league-worst 33.6 points per game since Nov. 3. I’ll take the former, thanks. Buffalo (6-9) at New England (11-4): How about the Patriots? No Aaron Hernandez. No Rob Gronkowski. No Wes Welker. No Danny Woodhead. No Jerrod Mayo. No Vince Wilfork. And now, no Nate Solder. And what do they do? Just win 11 games, their fifth straight AFC East title, and put themselves in position to clinch another first-round bye and playoff home game. Not bad, Mr. Belichick. Tampa Bay (4-11) at New Orleans (10-5): The Saints will take care of business at home. What they do on the road in the playoffs, though, is what concerns me. Will this be Greg Schiano’s last game as head coach in Tampa Bay? I hope not. Tampa plays hard for Schiano, and with a fresh start in 2014, they could be the sleeper squad no one will want to face next year. San Francisco (11-4) at Arizona (10-5): The Cardinals are playing as well as any team in the league, but it looks like they’ll be the first team since the 2008 Patriots to go 11-5 and miss the playoffs. San Francisco has plenty to play for in this game if Seattle loses, but I don’t think it’ll matter. I’d pick the Bird Gang over every other team in the league in the desert this weekend. Kansas City (11-4) at San Diego (8-7): The Chargers will know if they’re eliminated from the playoffs before kickoff. If the answer’s yes — which is how I see it — I still see them giving it their all for the fan base. In his ninth year, Philip Rivers is having as good a season as ever. He’ll finish it up strong. St. Louis (7-8) at Seattle (12-3): Want to throw a wrench in everybody’s Super Bowl predictions? How about the Rams stifling the Seahawks and giving Seattle its second home loss in as many weeks? I watched the Arizona-Seattle game tape and I can’t say I’m feeling too hot about the Seahawks offense. That said, with so much at stake, I can’t pick against Seattle in the season finale. The offense better wake up, though. And soon. Philadelphia (9-6) at Dallas (8-7): Chip Kelly’s Eagles looked eerily similar to Chip Kelly’s Oregon Ducks last week. They’re lights out on offense, they’re a matchup nightmare and the defense is keeping up with the pace. Guess what? I like Dallas on Sunday. No Sean Lee. No Tony Romo. But if we’ve learned anything this season, expect the unexpected. The Cowboys find a way, send the Eagles packing and face the Saints in the wild-card round next week. Oh, baby.